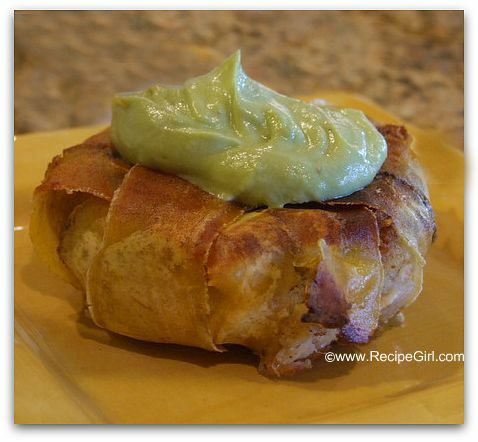 Plantain- Wrapped Crab Cakes with Avocado Aioli. 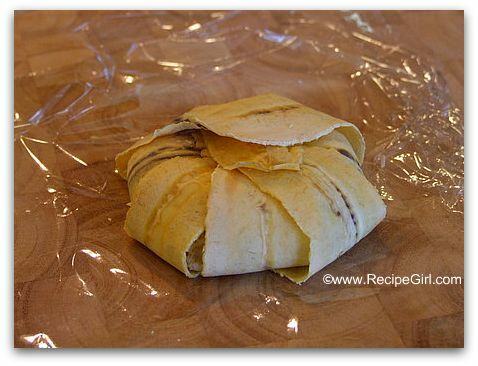 I went into this recipe thinking that I was making some sort of exotic banana-wrapped crab cakes. 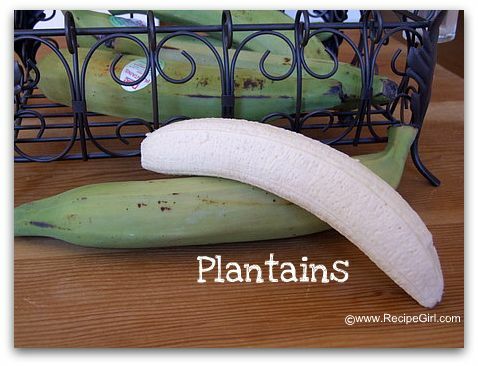 I had seen plantains before, and I assumed they were just like bananas. Oh, how wrong I was! I started to unpeel the plantain and couldn’t figure how why the the thing wasn’t peeling easily, and even more surprising was that I found myself holding a rather rock-hard banana. “What the heck?” I thought. Then I took a peek at the produce sticker, which said…”Plantains are similar to potatoes and should be cooked the same way.” Hmmmm. That was a rather interesting discovery for me, and it actually made more sense for this recipe. 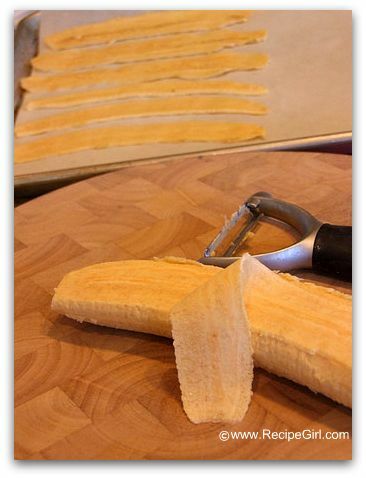 I used a potato peeler to get long strips of plantain slices. The slices were then baked for about 3 minutes, just to get them soft enough to become pliable. 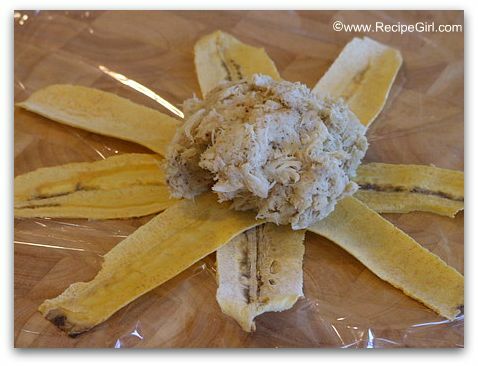 Since the plantains are used to wrap around the crab cake, you arrange them out in a wheel-spoke sort of fashion. The crab cake mixture is plopped into the middle. 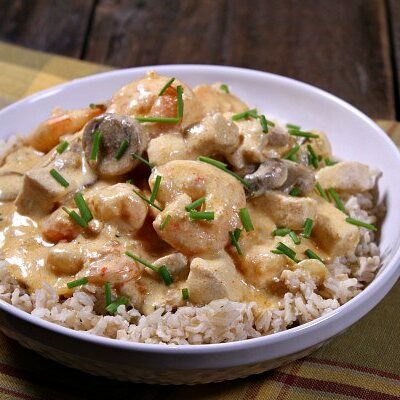 (The crab mixture consists of seasonings, egg, breadcrumbs and crab). I used a tub of fresh crabmeat from Costco’s refrigerated section (by the cheeses). The plantains are then wrapped around the crab cake. 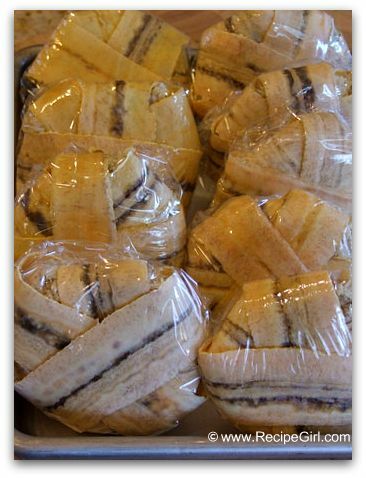 The cakes are wrapped tightly in plastic wrap and are refrigerated until ready to cook. 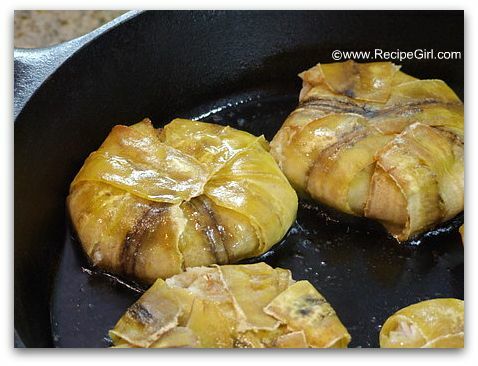 They’re fried in a little bit of oil until lightly browned on both sides. Then they’re served immediately with a scoop of avocado aioli (basically an avocado that has been whirred in the food processor with a bit of water, sour cream & lime). 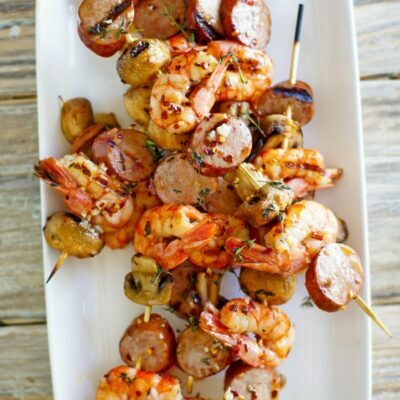 I fried these up at home, then placed them into a foil-lined plastic tub for transport to the party. When I got to the party, I put them on my serving platter & then popped the platter in the host’s microwave for about 1 min., which added just enough warmth for serving. These were definitely a very unique appetizer. I’ve never had crab cakes made this way, or wrapped with anything but breadcrumbs for that matter. I thoroughly enjoyed them, as did the other Gourmet group members. 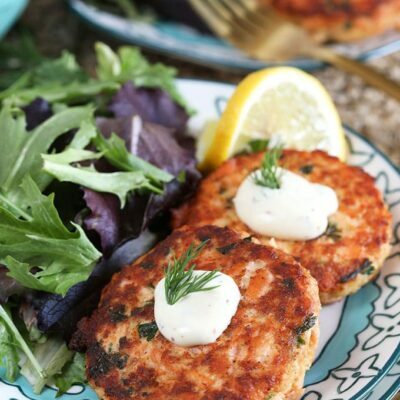 The plantain creates a slightly crunchy exterior to the crab cake. They can be eaten with a fork, or they can be picked up and dunked in the aioli. 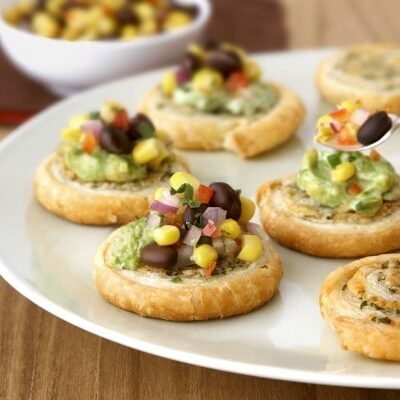 Wow, those look glorious! I love the presentation. These look and sound really good. 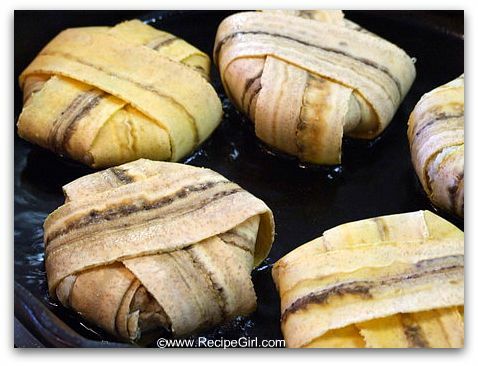 I have been wanting to try doing something with plantains. Umm can I move to your neighborhood?? This whole meal looks deliciously amazing. Of course, any meal involving mojitos is amazing, but wow! 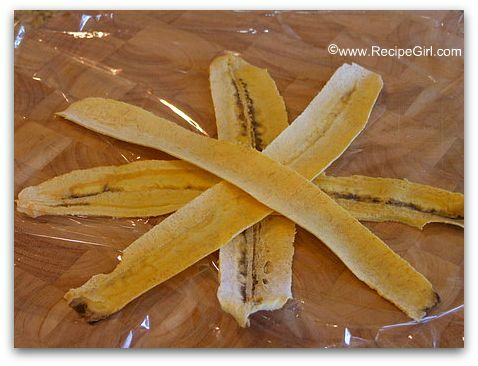 Fry the plantains when they are rip & sweet. I’ve never had plantains, but I’m always promising myself I’m going to try them one day. These look amazing! What a fantastic idea and so elegant. Im stealing this! this sounds absolutely phenomenal! I am going to make this soon!